For the most recent reports from St.Maarten/St.Martin see this page. 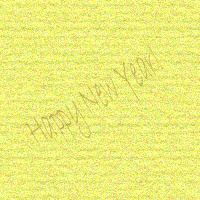 Happy New Year to all of the Caribbean islands. I know everyone will be rockin' tonight. St. Maarten has happenings all over the place. The Maho Hotel area will be hopping. That's over the hill from me though and no way am I fighting the bumper to bumper traffic. So it's to the Philipsburg Boardwalk for me. The Boardwalk will be hopping too with a laser light show, fireworks and a soca concert by Destra! there will be thousands there to bring in 2007! Too many people for me, but I can't stay home, can I?? I hope you all have a wonderful night tonight and I hope 2007 is happy , healthy, and storm free for all of us! Cloud Fun: Bringing FUN to your email FREE! Click Here! Well, Christmas came early for me. A surprise Christmas present arrived on my doorstep last night all the way from Virginia. He is too cute. I couldn't re-gift him. 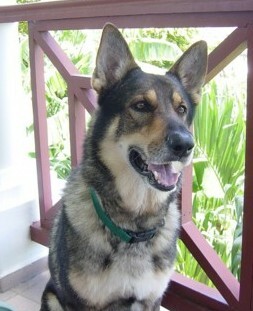 He's a German shepherd and his name is Sonny! Holiday Greetings to all the Caribbean Stormcarib correspondents. We here on St. Maarten wish you all a Merry Christmas and a happy healthy 2007. Our island is busy busy busy as I am sure all the other islands are. The stores are filled with holiday shoppers. The roads are packed. Traffic jams everywhere...one of the not so joyous things about the season. Today is a glorious day with light winds and blue skies. No snow in the forecast so I guess we won't be having a white Christmas. Hey, that's no problem, mon! The cruise ships are in Philipsburg daily. 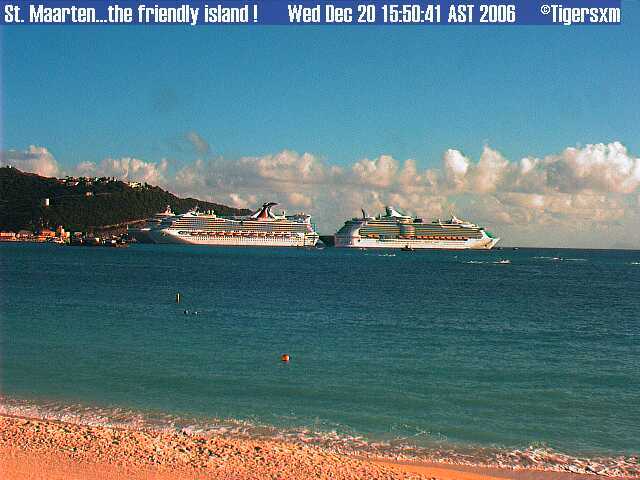 Here is a shot of the ships at the pier today from the web cam at Great Bay Villas. Cloudeight Funletters: Bringing FUN to your email FREE! Click Here! GREAT BAY, St. Maarten (GIS) – Chairman of the Emergency Operations Center (EOC) Governor Franklyn Richards, is thankful that once again the nation has been spared from a direct hit by a hurricane. “We have much to be thankful for and an uneventful hurricane season is one of them. The 2006 hurricane season comes to an end on November 30 until next year. “I would like to thank the people of this great nation for making the necessary preparations for the season. Preparation is the key. It’s an investment that must be made at the beginning of every season in order to protect life and property,” Governor Franklyn Richards told the Government Information Service (GIS) on Wednesday. Governor Richards added that the Island Government will continue to make investments in disaster mitigation. “It is required, action today to prevent calamity tomorrow. Government has invested in a siren alert system which is located in seven districts to warn the populace against a number of possible calamities (flash flood, tsunami, hazardous materials accident). It is an investment in our collective future,” Governor Richards pointed out. The United Nations (UN) has reported that over the last 30-years, natural disasters have affected five times more people than they did only a generation ago. Things are getting worse as the global climate changes, threatening more extreme weather. This year alone, 117 million people have suffered from some 300 natural disasters, including devastating droughts in China and Africa and massive flooding throughout Asia and Africa, costing nearly US$15 billion in damages. The UN has put disaster risk reduction on the front burner ever since the 2004 Indian Ocean tsunami, when experts said scores of thousands of the more than 200,000 dead could have been saved if early warning systems had existed and allowed them to escape to higher ground in the hours between the earthquake that triggered the tidal wave and their landfall. Governor Richards is very pleased that in the accord signed between Holland and St. Maarten, a calamity regulation is envisioned to fall under the proposed Government Credit Bank which would allow the island to finance the first necessities in the event of calamities, quickly and adequately. MedPRO - Designed to broaden public knowledge by informing. Do we have monsoon season in the Caribbean? It feels like it here this morning. My love birds love this weather though. They are chattering away like crazy. It's becoming a regular occurrence, it seems. Us being awakened before dawn by heavy rain and a fierce thunder and lightning show! The heavens opened up this morning for the second day in a row and a another 1.5 inches of rain fell again. If my math is correct that is approximately 8 inches of rain since Tuesday. Skies are still cloudy and it is drizzling but it does look like this weather is ever so slowly moving out of our area. MJ, do you want me to send you some socks? I got an extra pair and , believe me, I was wearing some socks myself this morning. Rain here has stopped for the most part. Skies are still gray and it is drizzling. I also have been officially informed that schools on the island were not cancelled. My bad! ELSEWHERE...TROPICAL STORM FORMATION IS NOT EXPECTED THROUGH FRIDAY. It's been raining heavily since about 5:00 this morning. Lots of thunder and lightning too. All schools are cancelled. The radio is asking people to stay home because of road flooding. My rain gauge says 3 inches and still counting. The rain has let up some right now. We can still hear thunder. I guess it's not over yet. it's a good day to stay home with a good book! It's a rainy day in paradise today: heavy rain and thunderstorms over night and a heavy one early this morning. According to my little rain gauge, we had 2 1/2 inches of rain over night. We can still hear thunder in the distance and the sky is gray. Looking towards the South the sky looks very dark. The dog is staying very close to me. It looks like 90L has fizzled out ! We have cloudy skies and some wind but not even any rain! We are watching the satellites very carefully right now. There is a trough North of Puerto Rico that is drifting SE. There is an invest 90L that is heading NW to NNW. The computer models are forecasting it to pass pretty close to us. Now it all depends on how far East the trough drifts and the timing of the 2 systems. I hope we get some much needed rain but I hope the two systems do not meet right over us. Then we get a flood event instead of a rain event. I'll dance in the rain as long as it is not too much and as long as it does not knock all my bananas off the tree. GREAT BAY, St. Maarten (GIS) ? On Monday, October 2nd at 12.00PM, seven districts on the island will simultaneously hear the Community Alert Siren Warning System. The siren should also be heard while indoors or while driving in a vehicle. When the siren sounds, in most cases it means that it is the regularly scheduled test and no emergency exists. This will be the case on Monday, October 2 at 12.00PM and every first Monday of every month. A 10 second tone will be broadcasted followed by a 20 second message. The tone and message will be repeated a second time during the monthly test phase. In times of an emergency, the siren will be sounded along with the warning message three times in a row every five minutes. Thereafter, every 15 minutes the siren will sound along with the emergency until the all clear sign has been given that the emergency situation is over. The monthly test is to ensure that the system is operating properly. Activation of the system at any other time is a warning that an emergency situation exists. The alert siren warning system is an electronic, state of the art siren system with the purpose of warning residents in times of an emergency. When emergencies and disasters of all types occur, rapid and effective communication of instructions and essential information to the public can significantly help to reduce loss of life and property. After the tragic 2005 flash flood that took the lives of two persons, the Executive Council took the decision to put in place mitigation measures such as this early warning system. The siren can warn residents about a flash flood, a tsunami (tidal wave), an evacuation of a specific area, a hazardous materials accident, general emergency conditions and that a curfew is in effect. The seven sirens are located in Mary?s Fancy, Ebenezer, Madame Estate, Dutch Quarter, Belvedere, Cole Bay and Philipsburg. These areas were selected due to a high risk of flooding. Additional sirens will be installed in other districts such as Simpson Bay, Cay Bay, Suckergarden, Point Blanche and Cay Hill. These areas have been selected due to possible hazardous material risks. 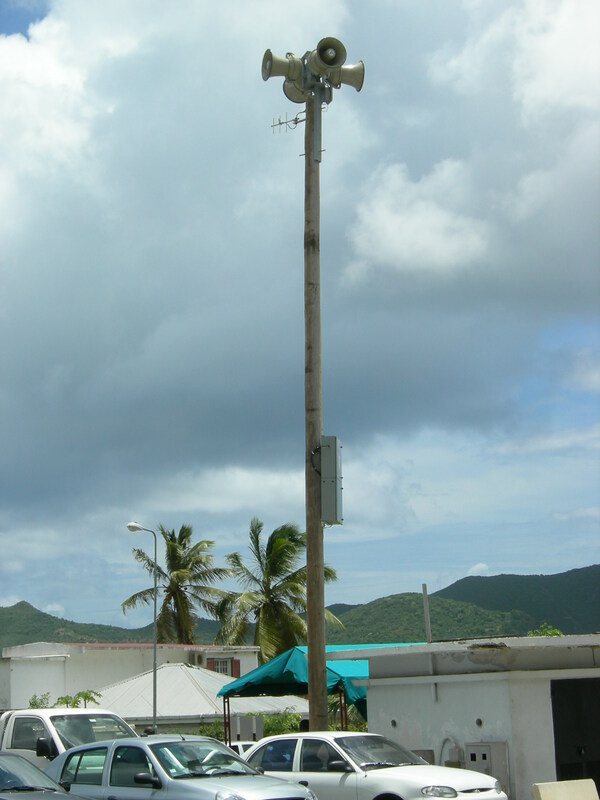 The Island Government decided to install the first sirens in high risk areas first followed by a phased installation of others in 2007. The siren system is designed to function together with local radio stations to keep citizens informed in the event of a life-threatening situation. Residents will be asked to tune in to their local radio station to learn the nature of what is happening rather than calling 911. It is very important to keep emergency phone lines open. An extensive awareness campaign has just started and this will be carried out over a period of three months to sensitize the community to the new siren warning system. Want to be your own boss? Learn how on Yahoo! Small Business. How low will we go? Check out Yahoo! Messenger?s low PC-to-Phone call rates. GREAT BAY, St. Maarten (GIS) ? On Monday, October 2nd at 12.00PM, a number of districts on the island will simultaneously hear the Community Alert Warning System Siren. When the siren sounds, what does it mean? In most cases it means that it is the regularly scheduled test time and no emergency exists. This will be the case on Monday, October 2 at 12.00PM and every first Monday of every month. The test is to ensure that the system is operating properly. Activation of the system at any other time is a warning that an emergency situation exists. 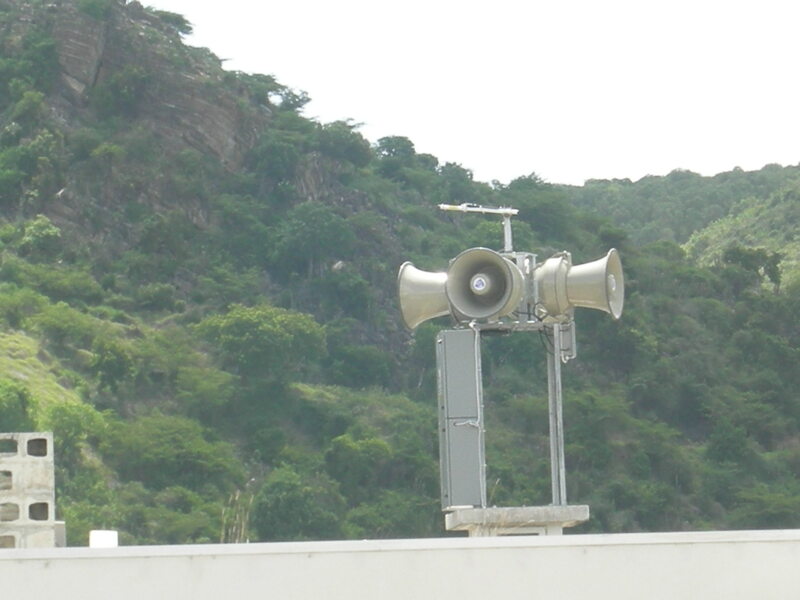 The alert warning siren system is an electronic, state of the art siren system which was specifically designed to provide comprehensive coverage with seven sirens strategically located throughout the island. The purpose of the community alert warning siren is to warn residents about in times of an emergency. When emergencies and disasters of all types occur, rapid and effective communication of instructions and essential information to the public can significantly help to reduce loss of life and property. After the tragic 2005 flash flood that took the lives of two persons, the Executive Council took the decision to put in place mitigation measures such as this early warning system. The sirens are located in Mary?s Fancy, Ebenezer, Madame Estate, Dutch Quarter, Belvedere, Cole Bay and Philipsburg. These areas were selected due to a high risk of flooding. A meeting was held this week with radio station owners and operators concerning their role with respect to the siren warning system. The siren system is designed to function together with local radio stations to keep citizens informed in the event of a life-threatening situation. Residents will be asked to tune in to their local radio station to learn the nature of what is happening. A 10 second tone will be broadcasted followed by a 20 second message. The tone and message will be repeated a second time during the test monthly phase. All-new Yahoo! Mail - Fire up a more powerful email and get things done faster. Oops. Looks like the first part of my email got lost in cyber space. Have no fear, Miss Mermaid and MJ. Today we have a nice breeze after days of dead calm. that's 10 MPH winds with gusts to 12 MPH. We had some rain last night and there are rain clouds over the hills now so I think we are about to get more rain. The only problem is after the showers, it feels like a steam room. so the heat is still on! The weather certainly has changed here. All of a sudden the sun is gone and the sky has darkened. We are in the midst of a horrendous downpour and it sems to be just sitting over my house. I just heard a very loud rumble of thunder also but the satelitte pics don't show anything. I sure can't see my friends in Statia any more though. 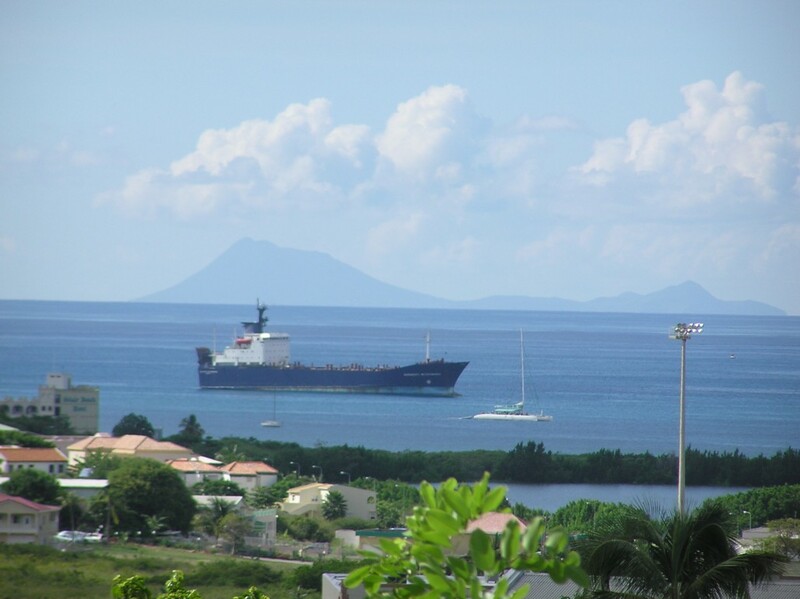 A special hello to Statia which I can see bright and clear from my balcony. Like the rest of the Northern Caribbean, it is a sunny day with utterly calm seas.... The sea is like a lake. 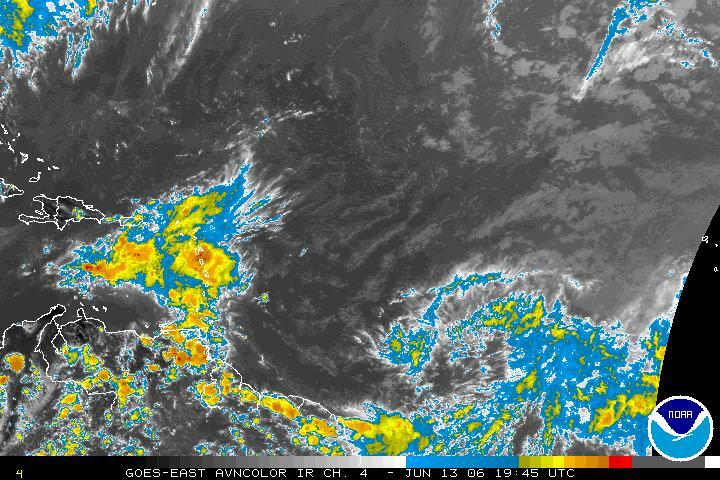 SHIP REPORTS AND SATELLITE IMAGES INDICATE THAT A TROPICAL DEPRESSION HAS FORMED FROM THE TROPICAL WAVE THAT MOVED OFF THE WEST COAST OF AFRICA YESTERDAY. AT 1100 AM EDT...1500Z...THE CENTER OF TROPICAL DEPRESSION EIGHT WAS LOCATED NEAR LATITUDE 12.5 NORTH...LONGITUDE 23.0 WEST OR ABOUT 185 MILES...295 KM...SOUTH-SOUTHEAST OF THE SOUTHERNMOST CAPE VERDE ISLANDS. THE DEPRESSION IS MOVING TOWARD THE WEST NEAR 18 MPH AND THIS GENERAL MOTION IS EXPECTED TO CONTINUE FOR THE NEXT 24 HOURS. MAXIMUM SUSTAINED WINDS ARE NEAR 30 MPH...45 KM/HR...WITH HIGHER GUSTS. SOME STRENGTHENING IS FORECAST DURING THE NEXT 24 HOURS...AND THE DEPRESSION COULD BECOME A TROPICAL STORM WITHIN THE NEXT DAY OR SO. REPEATING THE 1100 AM EDT POSITION...12.5 N...23.0 W. MOVEMENT TOWARD...WEST NEAR 18 MPH. MAXIMUM SUSTAINED WINDS...30 MPH. MINIMUM CENTRAL PRESSURE...1007 MB. It looks like Bermuda has escaped the worst. Thanks to all the Bermuda correspondents for keeping us updated. Glad you guys rode out Flo OK.
PROPERTY SHOULD BE RUSHED TO COMPLETION. ISLAND OF BERMUDA THIS AFTERNOON. HURRICANE AS IT PASSES BERMUDA. TROPICAL STORM FORCE WINDS EXTEND OUTWARD UP TO 260 MILES...415 KM. THE ESTIMATED MINIMUM CENTRAL PRESSURE IS 976 MB...28.82 INCHES. OF BERMUDA AS FLORENCE PASSES NEAR THE ISLAND. MPH. MINIMUM CENTRAL PRESSURE...976 MB. We wish our friends on Bermuda the best. Stay safe and dry, folks! Here is a Bermuda web cam which shows already the dark clouds coming in. GREAT BAY, St. Maarten (GIS) ? Governor Franklyn Richards, says with Tropical Storm Florence, the sixth storm for the Atlantic Hurricane Season, forecasted to pass well north of the islands of the Eastern Caribbean by the end of the week or over the weekend, resident?s should continue to monitor weather reports as we are in the peak period of the season. ?We can?t afford to be complacent as we are now in a very active period of the hurricane season. This can be seen from the storm systems that are forming just about one every week. Now is the time for residents to review what preparations are in place and the frequent development of these systems should therefore serve as a warning that it is better to be safe than sorry, ?Governor Richards, Chairman of the Emergency Operations Center told the Government Information Service (GIS) on Wednesday. Hurricane forecaster from the Colorado State University, Philip Klotzbach who has taken over from the infamous Professor William Gray, has revised their projections of the number of storms with their September-only forecast which calls for a total of 13-named storms, with five becoming hurricanes and two developing into major hurricanes with winds over 111 miles per hour. This is down from 15 named storms, seven hurricanes and three intense hurricanes they predicted on August 3. For the month of September, the aforementioned forecasters call for September-only five named storms, of which three could become hurricanes and two of these intense hurricanes. In October, the forecasters call for two named storms with one developing into a hurricane. 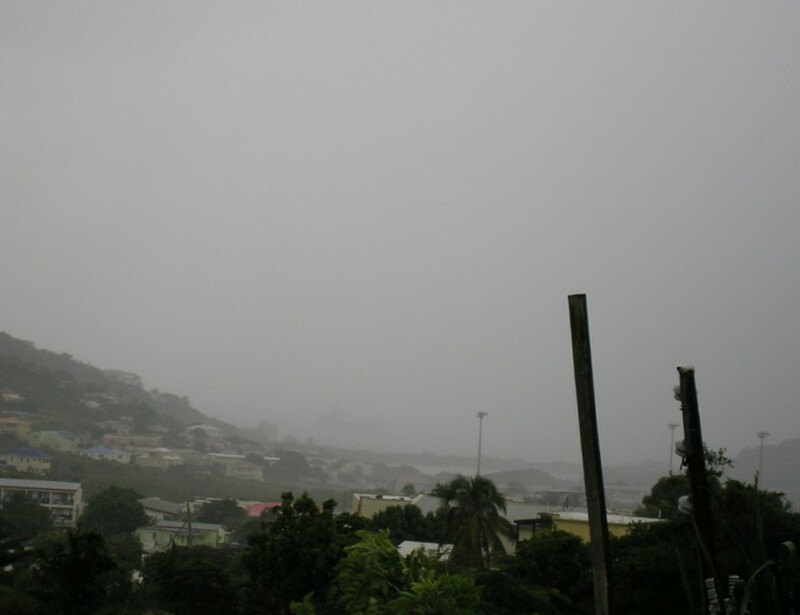 The Office of Disaster Management & Preparedness would like residents to take note that even though the forecast has been revised where we would see less storm activity, St. Maarten is now in the peak period of the hurricane season which runs up to mid-October, and residents should not let their guard down. Residents are reminded that we should always, ?Prepare Early: Better Safe than Sorry,? as the Office of Disaster Management & Preparedness theme says for the 2006 hurricane season. The names of storms left for this season will be: Gordon, Helene, Isaac, Joyce, Kirk, Leslie, Michael, Nadine, Oscar, Patty, Rafael, Sandy, Tony, Valerie and William. Everyone is raving about the all-new Yahoo! Mail. A group of around 100 Royal Dutch Marines, based in Aruba and Curaçao, has arrived on Sint Maarten on Wednesday August 30th for the annual Hurricane Exercise (HUREX). HUREX is intended to familiarize the Marines with the situation in the Windward Islands, know the locations of the hurricane shelters, know the partners in the disaster management system and to prepare themselves in the event they will have to render assistance if a hurricane threatens the islands. The HUREX is prepared annually in close cooperation with the local disaster management organizations. Thursday, Friday and partly Saturday will be used for theoretical classes and to familiarize the particpants with the islands. On Saturday afternoon the actual hurricane simulation will commence. 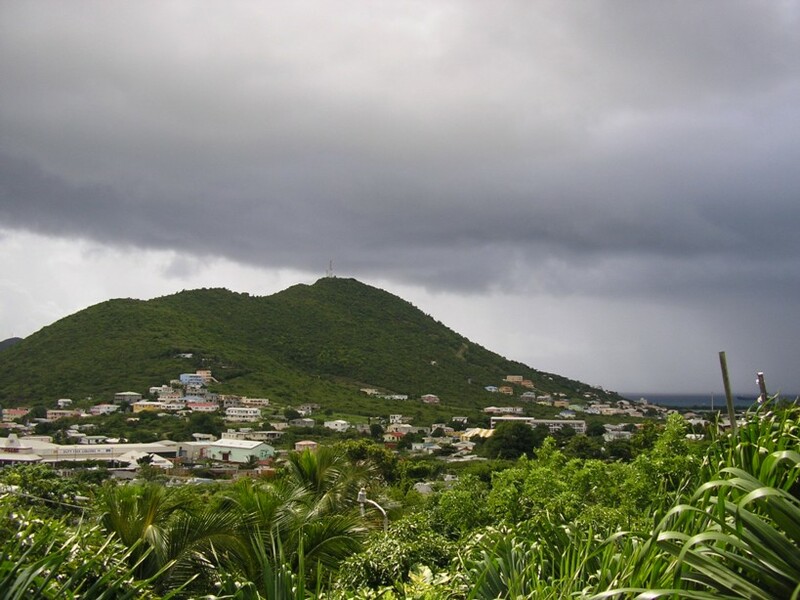 Shelters will be manned only in Sint Maarten. The internal communication system will also be tested on Saba and Sint Eustatius. Members of the VKS and Red Cross will assist the Marines similar to an actual hurricane situation. The shelters will be manned until early Sunday morning, after which the exercise will move to the Mullet Bay area, where certain situations will be simulated. On Monday the frigate "Van Amstel" will also take part in the training when Marines on land and the crew of the frigate will engage in a disaster exercise. The Commander of the Naval Forces in the Dutch Caribbean, Commodore Frank Sijtsma, will attend the exercise on Monday September 4th. The public in general is hereby informed that they might notice Marines training, guarding certain objects or firing blank shots. Any inconvenience caused is hereby regreted. The group will leave the islands on Wednesday morning September 6th. 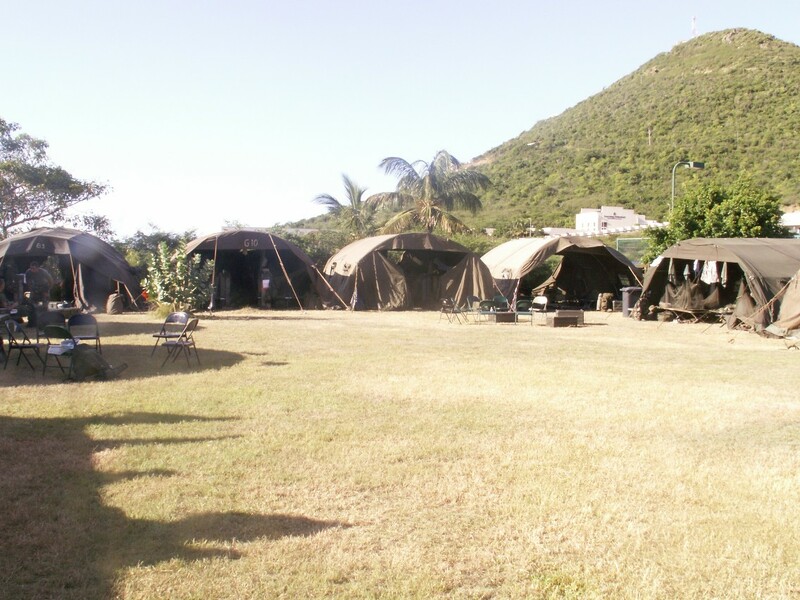 In the attachment a picture of the camp the Marines have set up at the Raoul Illidge Sports Complex. Those media interested in attending (part of) the exercises, are requested to call Major Dennis Volmer, the commander in charge of the exercise on 557-0599. Get on board. You're invited to try the new Yahoo! Mail. It was a beautiful clear day in St. Maarten today. We could see all of our neighboring islands..Anguilla and it's white sand beaches...Saba and Statia.. We could see houses on Saba too. And we even could see St. Kitts and Nevis very clearly. St. Kitts is about 65 miles away so the visibility was outstanding. And it's hot! Man, is it hot! And we need rain. Everything is starting to look brown again. Other than that, we are fine on SXM. ... happy it's been a quiet hurricane season so far. The Tropical Wave off the coast of Africa and in the vicinity of the Cape Verde Islands as of August 28 looks like trouble on the horizon. From sat pix it even looks like a circulation is building. Today, it's sunny and overcast with a gentle breeze. The island is nice and green. The evening hours continue to bring small brief showers. Have a great day and week, and keep watching the Atlantic. Just got an email from my friend on the other side of the island. She and her husband definitely felt that earthquake too, even here on St. Maarten. for the St. Croix and Tortola correspondents, here is the information on your earthquake. apparently it was a  5.0.
all quiet on St. Maarten. GREAT BAY, St. Maarten (GIS) ? Governor Franklyn Richards, says that Tropical Storm Chris last week served as a wake up call for those residents who aren?t prepared for this year?s hurricane season adding that Chris was also a good exercise for those who did heed the call to prepare that came from the Emergency Operations Center & Office of Disaster Management & Preparedness. Hurricane forecaster from the Colorado State University, Philip Klotzbach who has taken over from the infamous Professor William Gray, has revised their projections of the number of storms expected slightly downward, but still say that the 2006 Atlantic hurricane season will be above average. The above average was also reiterated by the National Oceanic & Atmospheric Administration (NOAA) on Tuesday when they released their revised the number of named storms of between 12-15 of which seven to nine are forecast to become hurricanes and three to four could become major hurricanes of category three or higher. For the month of August, the Colorado hurricane specialist forecasts four named storms, of which three are expected to become hurricanes with one becoming a major hurricane of wind speeds over 111 miles per hour. ?With tropical storm Chris now gone, the St. Maarten community should not to be lulled into a false sense of security as history has taught us and others in the Caribbean that a hurricane can still threaten the region and in particular St. Maarten this hurricane season, and it only takes one. Everyone should continue to monitor weather reports in order to take quick action to finalize preparations when you are asked to do so,? Governor Richards told the Government Information Service (GIS) on Thursday. The Office of Disaster Management & Preparedness would like residents to take note of the revised hurricane forecasts including the one this week from the NOAA which has been widely publicized in the media for the coming months as we go into the peak period of the hurricane season which runs up to mid-October. The first step of hurricane preparedness is ensuring that you are adequately informed. For new residents, start by learning about hurricanes, and how they can affect the island and how to prepare. Learn the location of public shelters. Determine how safe is your area and inquire about flooding of low lying areas. Devise a hurricane preparedness plan. Decide from the onset where you will go if your house isn?t safe. Make sure the house you choose to shelter in is well constructed. If you own a boat, decide where to store it in the event of an emergency. Most importantly, ensure that your home and property insurance are up to date. Trim deadwood from trees and cut back overhanging branches. Check and repair loose gutters around the roof and downspouts. Check and repair loose or damaged roofing; install hurricane roof straps if you do not already have them installed. Check your hurricane shutters or plywood covers and the tools you need to install them. Practice installing them. Stock up on plywood if necessary. Get it measured, cut and labeled for each opening if you do not have shutters. Stock up on hurricane supplies. Begin collecting enough non-perishable food, water, first aid, and other survival supplies to last each person for the first three days after the passing of a hurricane and up to a week. To diffuse cost, the items can be purchased a little at a time by picking up some extras with each trip to the supermarket. Do not forget to stock up on any prescription medication your family may need, especially items for the young and elderly. During the hurricane season keep your vehicle?s gas tank more than half full at all times. Around this time last year, the Caribbean region had a brush with Dennis followed by Ivan, Katrina, Rita and Wilma, all considered ferocious hurricanes. The names of storms left for this season will be: Debby, Ernesto, Florence, Gordon, Helene, Isaac, Joyce, Kirk, Leslie, Michael, Nadine, Oscar, Patty, Rafael, Sandy, Tony, Valerie and William. Next-gen email? Have it all with the all-new Yahoo! Mail Beta. GREAT BAY, St. Maarten (GIS) ? Governor Mathias Voges, Chairman of the Emergency Operations Center (EOC), would hereby like to inform the general public that according to the Netherlands Antilles & Aruba Meteorological Service (Met Office), the Tropical Storm Warning for St. Maarten should be discontinued within the next few hours as Tropical Storm Chris moves further away from the island. Tropical Storm Chris at 5.00AM according to the Met Office was located 60 miles east northeast of the island and on its current track is continuing to move away. The storm has wind speeds of 60 miles per hour and is moving west northwest at 10 miles per hour. The severe tropical storm is forecast to be 115 miles northwest of the island by 2.00PM this afternoon. According to the Met Office, the center of the storm passed just north of the island, keeping St. Maarten just outside the area of tropical storm force winds. Rainfall has been widespread over the island, with gusts in some heavier showers, mainly over the northern part of the island. Shower activity may still occur over the island during the next 24 hours due to rain bands extending from the tropical storm occasionally accompanied by gusty winds. Seas will gradually subside and the Small Craft Warning has been discontinued, but boat owners should still exercise caution. Governor Voges would like to thank the nation for heeding the call to prepare for Tropical Storm Chris. ?On Tuesday, the community was alerted to the impending storm and requested to take certain measures and were also cautioned on what not to do. Everyone had sufficient day-light time and early evening to take what steps were necessary based on the threat. ?I would also like to take this opportunity to thank the public servants and private companies that worked along with some of the Emergency Support Functions (ESFs) especially the Public Works Department (ROB) who worked diligently for hours to make sure that all waterways were free from debris and other obstructions with respect to possible flooding. ?The proactive approach taken by all ESFs that have been involved in preparing for the threat of Tropical Storm Chris went very well and one can consider this being an exercise for our first storm of the hurricane season. I would like to remind residents that we should always, ?Prepare Early: Better Safe than Sorry,? as the Office of Disaster Management & Preparedness theme says. Thank you and May God continue to Bless St. Maarten,? Governor Voges told the Government Information Service (GIS) in his final EOC advisory on Chris. Groups are talking. We´re listening. Check out the handy changes to Yahoo! Groups. GREAT BAY, St. Maarten (GIS) ? Governor Mathias Voges, says that today Wednesday, August 2, 2006 is a normal business and government working day. Voges told the Government Information Service (GIS) this morning that a number of inquiries have come in to the Office of Disaster Management & Preparedness on whether today everything would be closed due to the passing of Tropical Storm Chris, and this is not the case. ?Today is a normal working day for everybody who has to report to work. Tropical Storm Chris is moving away from our area, but we will release more information on this as we receive it. It?s business as usual for the public and private sectors,? Governor Voges told the GIS early Wednesday morning. GREAT BAY, St. Maarten (GIS) ? Governor Mathias Voges, Chairman of the Emergency Operations Center (EOC) is advising residents to finalize preparations this evening for tropical storm conditions which are expected late tonight and tomorrow as the island remains under a Tropical Storm Warning. Tropical storm conditions are expected within the next 12 to 18 hours. Tropical Storm Chris at 5.30PM was located 75 miles Northeast of Antigua, moving toward the west-northwest near 10 miles per hour. Maximum sustained winds are near and gusting to 60 miles per hour. Some strengthening is forecast during the next 24 hours. Tropical Storm Chris is forecast according to the Meteorological Service of the Netherlands Antilles & Aruba 6.00pm advisory, to pass 30 miles north of St. Maarten at around 2.00am Wednesday morning as a moderate tropical storm. Local conditions according to the Meteorological Services of the Netherlands Antilles & Aruba are expected to deteriorate as the system gets closer to the island chain. This will include increasing cloudiness with rain and thundershowers developing this evening and tonight. During the passing of Chris, showers may be heavy at times with the possibility of some local flooding. Later tonight wind speeds are expected to increase gradually to tropical storm strength of 40 to 50 miles per hour with gusts up to 60 miles per hour at times. Sea conditions are forecast to become rough this evening and persisting into Wednesday. A small craft warning is also in effect where small craft are advised not to venture from port and to take precautions to safeguard their vessels. All loose items in your yard should be properly secured including garbage bins. Coastal residents are advised of rough seas and to take the necessary measures. Residents are advised to avoid low lying areas within neighborhoods and on certain parts of the road network system during the passing of tropical storm Chris. Residents are advised to continue to monitor radio and TV reports for the latest weather updates with respect to the progress of tropical storm Chris. Open multiple messages at once with the all new Yahoo! Mail Beta. GREAT BAY, St. Maarten (GIS) ? Acting Governor Mathias Voges, Chairman of the Emergency Operations Center (EOC) is advising residents to prepare now for tropical storm conditions which are expected tonight and tomorrow as the island remains under a Tropical Storm Warning. Tropical storm conditions are expected within the next 12 to 24 hours. Tropical Storm Chris at 2.00PM was located 65 miles East-Northeast of Antigua, moving toward the west-northwest near 10 miles per hour. Maximum sustained winds are near 40 miles per hour with higher gusts. Some strengthening is forecast during the next 24 hours. Tropical Storm Chris is forecast according to the Meteorological Service of the Netherlands Antilles & Aruba 12.00pm advisory, to pass 25 miles north of St. Maarten at around 2.00am Wednesday morning. The third storm of the 2006 hurricane season continues on its track towards the North Eastern Caribbean islands. Residents are urged to continue to monitor weather reports. Chris is not a hurricane, but a tropical storm that will bring tropical storm conditions. Local conditions according to the Meterological Services of the Netherlands Antilles & Aruba are expected to deteriorate as the system gets closer to the island chain. This will include increasing cloudiness with rain and thundershowers developing this evening and tonight. During the passing of Chris, showers may be heavy at times with the possibility of some local flooding. Residents should use what is left of the daylight hours and early evening hours to prepare for tropical storm conditions. All loose items in your yard should be properly secured including garbage bins. Construction sites should have been secured by the end of the work day. Coastal residents are advised of rough seas and to take the necessary measures. Residents are advised to avoid low lying areas within neighborhoods and on certain parts of the road network system during the passing of tropical storm Chris. The Department of Public Works (also known as ROB) has already taken necessary flood prevention measures and will continue to work throughout the night to make sure that everything is in place for the passing of tropical storm Chris. Voges is reminding residents that we are in the hurricane season and that they should always, ?Prepare Early: Better Safe than Sorry,? as the Office of Disaster Management & Preparedness theme says. Talk is cheap. Use Yahoo! Messenger to make PC-to-Phone calls. Great rates starting at 1¢/min. GREAT BAY (GIS) ? Tropical Storm Chris according to weather advisories at 11.00am was located 100 miles East of Antigua as it continues on its track towards the Northern Leeward Islands. Tropical Storm conditions are expected within the next 12 to 24 hours. Conditions expected are heavy rains and gusty winds as well as rough seas. Tropical Storm Chris is expected to move over or near the northern most Leeward Islands, which includes St. Maarten later tonight or early Wednesday morning. Maximum sustained winds remain at 40 miles per hour with higher gusts. Some strengthening is forecast during the next 24 hours. Tropical Storm force winds extend outwards up to 35 miles from the storm center. Rainfall amounts of three to five inches have been forecast with isolated higher amounts to near eight inches during the passing of the system. Contractors and builders are urged to secure building sites during the course of today in preparation for tropical storm conditions that are expected with the passing of Tropical Storm Chris. These preparations should be completed before the end of the workday. Residents living along the coast are advised to take measures with respect to high surf conditions that may be expected with the passing of Tropical Storm Chris. Residents are advised to stay away from low-lying areas during the passing of Tropical Storm Chris. Measures will be taken to open the channel if necessary at the Great Bay Beach. Equipment will be mobilized and stationed at the beach for quick action if required. Water levels in the Fresh and Salt Ponds will be lowered to accommodate any access rainfall that could be expected with the passing of Tropical Storm Chris. The Public Works Department has been busy clearing waterways and drainage works during the past weeks. On Tuesday personnel from the department will take stock of current conditions with respect to the aforementioned. An appeal is made to residents to secure garbage bins and other loose debris in their yards. A core group of the Emergency Operations Center (EOC) met at 8.15am on Tuesday morning for 45 minutes in the Government Administration Building to review preparations with respect to approaching Tropical Storm Chris and the Tropical Storm Warning that is in effect for St. Maarten and the other Leeward Islands. Residents are advised at this time to continue monitoring weather broadcasts in order to keep abreast of new advisories that would be issued throughout today and tomorrow with respect to the approaching storm. Why keep checking for Mail? The all-new Yahoo! Mail Beta shows you when there are new messages. GREAT BAY (GIS) ? A core group of the Emergency Operations Center (EOC) met at 8.15am on Tuesday morning for 45 minutes in the Government Administration Building to review preparations with respect to approaching Tropical Storm Chris and the Tropical Storm Warning that is in effect for St. Maarten and the other Leeward Islands. Tropical Storm Chris according to weather advisories at 8.00am is heading towards the Northern Leeward Islands. The storm is located 135 miles East of Antigua and is heading West North West at nine miles per hour. Tropical Storm conditions are expected within the next 12 to 24 hours. Tropical Storm Chris is forecast to move over or near the northern most Leeward Islands, which includes St. Maarten later tonight or early Wednesday morning. Maximum sustained winds are 40 miles per hour with higher gusts. Acting Chairman of the EOC Mathias Voges received an update with respect to the islands general state of preparedness concerning a storm or hurricane threat to the island. tomorrow with respect to Tropical Storm Chris. An additional advisory will be issued before noon with respect to the latest forecast. Residents will receive SMS messages via UTS and Telcell that St. Maarten is under a Tropical Storm Warning. The core group that met was the Fire Department, Police, the Department of Public Works, Gebe, GIS, Commissioner of Public Works Roy Marlin and the Island Secretariat. GREAT BAY, St. Maarten (GIS) ? With the 2006 hurricane season now in its second month, and the peak of the season still on the horizon, the Office of Disaster Management & Preparedness is urging livestock owners to review their plans now of how they will secure their livestock in the event of a hurricane strike. This appeal is in line with the Office of Disaster Management & Preparedness?s 2006 hurricane season theme, ?Prepare Early: Better Safe than Sorry.? Hurricane forecasters have warned that the 2006 hurricane season will be a very active one. Livestock owners should make sure that their animal holding areas and other infrastructure are in proper condition. Any loose material could damage property and endanger human lives during the passing of a hurricane. The following tips are being provided by the Office of Disaster Management & Preparedness and Animals R Friends: All cattle should have identification. 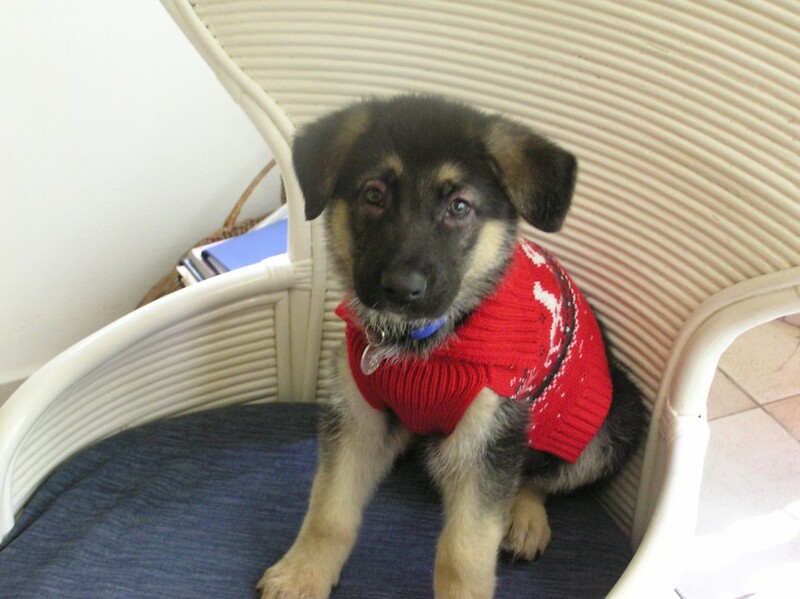 Identification can be an ear tag, ear notches, neck chain or microchip. Paperwork should also be in order that shows ownership. Don?t keep your cattle in a barn or stable to prevent injury from flying debris. If the barn collapses, cattle have no chance to save themselves. Relocate livestock to a predetermined safe area and ensure that they have access to hay, pasture, clean water, and a safe area or high ground above flood levels. If you have chicken cages, these should be reinforced. Medical supplies and a first aid kit should be kept on hand. Store drinking water for a number of days. Also have an adequate supply of feed. For further information regarding pet and animal safety during times of disaster, you can call Animals R Friends, 5575799, 5561191 and 5563688. The names of the storms for this season are: Beryl, Chris, Debby, Ernesto, Florence, Gordon, Helene, Isaac, Joyce, Kirk, Leslie, Michael, Nadine, Oscar, Patty, Rafael, Sandy, Tony, Valerie and William. The hurricane season runs from June 1 through November 30. GREAT BAY, St. Maarten (GIS) ? Governor Franklyn E. Richards, as Chairman of the Island?s Disaster Emergency Management Organization, the Emergency Operations Center (EOC), is calling on the St. Maarten community to review their hurricane to do checklist as we move further into the hurricane season. Richards adds that the season has already seen its first tropical storm, Alberto. Hurricane specialists have already forecasts a very active 2006 hurricane season and that at least one major hurricane will make landfall in the Caribbean. The forecast calls for 13-17 named storms, with 8 to 10 becoming hurricanes, and of these four to six becoming major hurricanes of category three strength or higher. The theme for this hurricane season is, ?Prepare Early: Better Safe than Sorry. Actions that should be taken now are: make sure that your hurricane shutters are in good working order. If you don?t have any, you should seek an alternative to securing your windows and doors of your home. Tree branches should be trimmed from around your home. The same also applies to businesses. Your yard and surroundings should be cleaned of all debris and non-household garbage that could fly around damaging your home and that of your neighbors. Stock non-perishable emergency supplies as part of a disaster supply kit. Have enough food (non-perishable) for three to seven days, packaged or canned food/juices; food for infants or the elderly; snack food; animal food; a non-electric can opener; cooking tools (matches)/fuel; paper plates and cups; plastic utensils; blankets and pillows. You should at least have one gallon daily per person of water for three to seven days. Other items that should form part of your disaster kit are: first aid kit (medicines, prescription drugs); toiletries; flashlight; extra batteries; a battery operated radio; extra cash; toys and games for the kids; books and magazines; secure important documents in a waterproof container; have adequate fuel in your vehicle; and keep a set of tools with you during the storm. ?As our theme for the season says, ?Prepare Early: Better Safe than Sorry.? Everyone should not wait until the last moment to do things. Everything should be in place already, and if not, do so now,? Governor Richards told the Government Information Service (GIS) on Thursday. The names of the storms for this season will be: Beryl, Chris, Debby, Ernesto, Florence, Gordon, Helene, Isaac, Joyce, Kirk, Leslie, Michael, Nadine, Oscar, Patty, Rafael, Sandy, Tony, Valerie and William. Yahoo! Music Unlimited - Access over 1 million songs. Try it free. The first tropical wave of the season passed through today. The day was rainy and windy. ..more wind than rain. We received almost 2 inches of rain but the wind was fierce. Gusts were recorded up to 39 MPH. We still have gray skies and wind. The satellite shows another wave just off Africa which probably will be affecting us in a few days. Looks like we might have an active Cape Verde season this year. GREAT BAY, St. Maarten (GIS) ? Hurricane forecasters have warned that the 2006 hurricane season will be a very active one and as the Island Government?s theme says, ?Prepare Early: Better Safe than Sorry,? contractors and builders are therefore requested to have a plan in place to prepare and secure their job sites for an impending hurricane strike. With up to 17 named storms forecasted, and up to 10 becoming hurricanes, of these four to six becoming major hurricanes of category three strength or higher, contractors and builders during severe weather are responsible for securing job sites for the protection of the public, the property and surroundings. Materials such as plywood, shingles, zinc, and scraps of 2x4s could become flying missiles capable of impaling brick walls or anything in its way. Construction debris can cause severe damage to property and cost lives. With the amount of building and construction activity currently taking place on the island, every construction site supervisor or foreman is advised to have a plan in place with respect to what action they will be taking, and the time is to prepare now before the peak period of the hurricane season. As a general rule, all jobsites should be kept clean. Arrange of timely pick up of trash dumpsters, and only keep materials on the job site you actually will install at any given week, and keep construction equipment secure, or remove them from the job site when a hurricane strike is impending. Any planned supply deliveries should be postponed. When a hurricane warning is issued, remove all scaffolding, and remove, or safely secure, all building materials and equipment. Sub contractors should also be alerted to their responsibilities as well with respect to securing or removing their materials and equipment. Stop job processes that will likely become damaged by the hurricane, such as window installations, house wrap, or landscaping. Complete those construction tasks that will likely prevent damage, such as concrete work, closing in a house, or filling in foundation excavations. Follow through with a quick inspection of your job sites. Do not wait until the last minute to inspect your job sites, as you may need that time to go home and secure your own family home. Employees will need to also do the same. Once the hurricane is over, return to the job site for damage inspection only when the all clear sign has been given by the Emergency Operations Center headed by the Governor of the Island Territory of St. Maarten. Keep in mind that damages from the hurricane may impede efforts for immediate repairs. The names of the storms for this season are: Alberto, Beryl, Chris, Debby, Ernesto, Florence, Gordon, Helene, Isaac, Joyce, Kirk, Leslie, Michael, Nadine, Oscar, Patty, Rafael, Sandy, Tony, Valerie and William. GREAT BAY (GIS)?Members and representatives of several Emergency Support Functions (ESFs) groups of the Island Government?s Disaster Management & Preparedness system, met on Wednesday morning to discuss the upcoming hurricane season, which officially starts on June 1st, and the readiness of each member in terms of hurricane preparedness. Winston Salomon, Disaster Coordinator, says that based on preliminary assessments the island?s disaster management system is prepared for the hurricane season. Now the communication process has to start to inform the people of St. Maarten. But also to continually communicate with the community so as they can prepare themselves. It is essential as well for persons to be proactive. Sector ROB Director Joseph Dollison said that the population has to take steps in cleaning up their yards, removing zink fencing, and not waiting until the last minute to do so. Currently, public works is busy cleaning out the gutters and culverts to assist with the drainage process of heavy rains, among other natural disasters such as flooding. In addition, an early warning siren system is being purchased and is scheduled to be installed in the near future. More information will be forthcoming. GREAT BAY, St. Maarten (GIS) ? Acting Governor Mathias Voges, as Acting Chairman of the Island?s Disaster Emergency Management Organization, the Emergency Operations Center (EOC), is calling on the St. Maarten community to prepare for what has been described by hurricane forecasters to become a very active 2006 hurricane season. The latest forecasts from Philip Klotzbach and William Gray of the Colorado State University and the U.S. National Oceanic & Atmospheric Administration (NOAA), do not differ much from each other. The forecast calls for 13-17 named storms, with 8 to 10 becoming hurricanes, and of these four to six becoming major hurricanes of category three strength or higher. The forecasters believe that at least one major hurricane will make landfall in the Caribbean. The 17 named storms that will form according to forecasters, will last for 85 days, or nearly half of the 182 days of the 2006 hurricane season. Hurricanes are expected to be active for 45 days and the intense or major hurricanes for almost two weeks. Climatology of the systems reveal that the Caribbean will be most at risk from August to October when storms tend to form in the Atlantic ocean East of the island chain. The most active part of the season is the 60-day window from August 15 to October 15. ?Six-months ago we saw the end of the 2005 season. On June 1, six months later, we see the beginning of a new season. I encourage the population to make preparations to better protect their lives and livelihoods. Full scale preparations are needed as you can?t be too prepared for a hurricane. ?Preparedness starts with every one of us. As a community we must plan early and don?t wait until the last moment. Private residents and the business community must be in a state of readiness should a hurricane hit. You only need to be hit by one system, and as a community we can all recall Hurricane Luis more than a decade ago. As our theme for the season says, ?Prepare Early: Better Safe than Sorry,?? Acting Governor Mathias Voges told the Government Information Service (GIS) on Wednesday. The names of the storms for this season will be: Alberto, Beryl, Chris, Debby, Ernesto, Florence, Gordon, Helene, Isaac, Joyce, Kirk, Leslie, Michael, Nadine, Oscar, Patty, Rafael, Sandy, Tony, Valerie and William. During a news conference at the NOAA National Hurricane Center, Deputy Secretary of Commerce David A. Sampson noted, "Preparation is the key message that President Bush wants to convey during National Hurricane Preparedness Week. The impact from these storms extends well beyond coastal areas so it is vital that residents in hurricane prone areas get ready in advance of the hurricane season." "For the 2006 north Atlantic hurricane season, NOAA is predicting 13 to 16 named storms, with eight to 10 becoming hurricanes, of which four to six could become 'major' hurricanes of Category 3 strength or higher," added retired Navy Vice Adm. Conrad C. Lautenbacher, Ph.D., undersecretary of commerce for oceans and atmosphere and NOAA administrator. On average, the north Atlantic hurricane season produces 11 named storms, with six becoming hurricanes, including two major hurricanes. In 2005, the Atlantic hurricane season contained a record 28 storms, including 15 hurricanes. Seven of these hurricanes were considered "major," of which a record four hit the United States. "Although NOAA is not forecasting a repeat of last year's season, the potential for hurricanes striking the U.S. is high," added Lautenbacher. Warmer ocean water combined with lower wind shear, weaker easterly trade winds, and a more favorable wind pattern in the mid-levels of the atmosphere are the factors that collectively will favor the development of storms in greater numbers and to greater intensity. Warm water is the energy source for storms while favorable wind patterns limit the wind shear that can tear apart a storm's building cloud structure. This confluence of conditions in the ocean and atmosphere is strongly related to a climate pattern known as the multi-decadal signal, which has been in place since 1995. Since then, nine of the last 11 hurricane seasons have been above normal, with only two below-normal seasons during the El Niño years of 1997 and 2002. With neutral El Niño/Southern Oscillation (ENSO) conditions expected across the equatorial Pacific during the next three to six months, the NOAA Climate Prediction Center scientists say that neither El Niño nor La Niña likely will be a factor in this year's hurricane season. "Whether we face an active hurricane season, like this year, or a below-normal season, the crucial message for every person is the same: prepare, prepare, prepare," said Max Mayfield, director of the NOAA National Hurricane Center. "One hurricane hitting where you live is enough to make it a bad season." The north Atlantic hurricane season runs from June 1 through November 30. NOAA will issue a mid-season update in early August just prior to the normal August through October peak in activity. The north Atlantic hurricane seasonal outlook is a product of NOAA's Climate Prediction Center, National Hurricane Center and Hurricane Research Division. The NOAA National Hurricane Center has hurricane forecasting responsibilities for the north Atlantic as well as the east Pacific regions. NOAA, an agency of the U.S. Department of Commerce, is dedicated to enhancing economic security and national safety through the prediction and research of weather and climate-related events and providing environmental stewardship of the nation's coastal and marine resources. Through the emerging Global Earth Observation System of Systems (GEOSS), NOAA is working with its federal partners, 61 countries and the European Commission to develop a global network that is as integrated as the planet it observes, predicts and protects. It seems that Montserrat's volcano was very active this morning. According to reports, the dome collapsed. Satellite imagery shows a large ash plume moving South west. It is forecast to reach the coast of South America in 12 hours. Thus it is moving away from the islands. Since my last posting, skies have remained cloudy over St. Maarten and the NE Caribbean. The tourists must be complaining because the days really have not been nice beach days. Last night we had some squalls come in. This morning continues to be very overcast. It looks like we may get some more rain. My husband made it back from Sailing Week in Antigua last night in the middle of those squalls. It took them 15 hours to sail from Antigua to St. Maarten. He said they had no wind until they got close to SXM and those squalls. Sailing Week was successful. The boat he was sailing on, L'Esperance, came in third in their class. Congratulations to the captain and crew! Well, we have had no rain to speak of in months. the island has been incredibly dry. It started raining last night and by morning the heavens opened up. There is over 2 inches in my rain gauge and it is still coming down. Of course, now all the roads are flooded and traffic is backed up all over the island. We had 4 days of holidays due to Carnival. Today is the first day stores have been open so everyone is out going to work and doing errands. Makes getting around kind of difficult. I think it's a good day for staying home and reading a good book. GREAT BAY, St. Maarten (GIS) ? 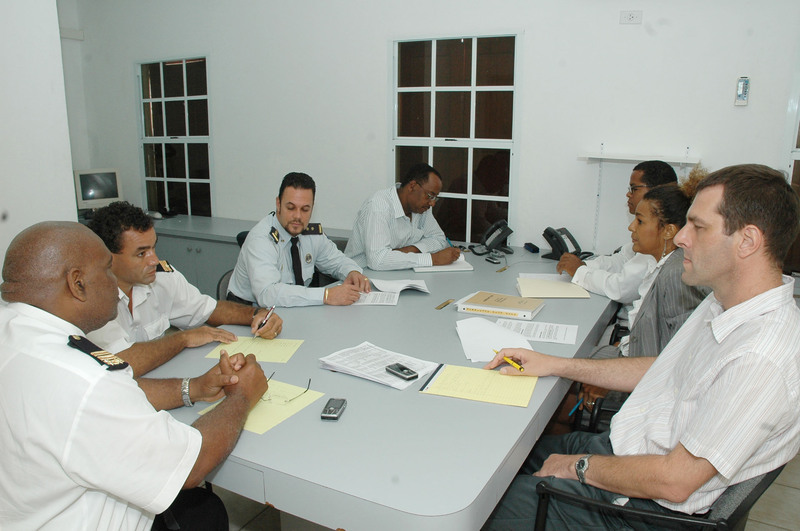 Disaster Management Coordinator and Fire Chief Winston Salomon, announced on Wednesday that St. Maarten will be hosting the Caribbean Hurricane Conference in 2007. Initial preparations are now getting underway; however an exact date still has to be established for the conference which will cater to the Caribbean islands. Salomon just returned over the Easter weekend from Orlando, Florida where he and Section Head Disaster Management Paul Martens, attended the 28th Annual National Hurricane Conference. ?We are very proud to have been selected for the venue of this conference that will be mainly geared towards the Caribbean islands. The past conference focuses more on the hurricane threat to the U.S. mainland with a few sessions on Tropical Islands. ?We are in the hurricane belt and the focus must be on how we are a region will continue to deal with and mitigate the damages coming from these natural events. We will be working in conjunction the organization that organizes the 2006 National Hurricane Conference and with the St. Maarten Tourist Office in order to make the Caribbean conference a huge success in 2007,? Disaster Coordinator Winston Salomon told the Government Information Service (GIS) on Wednesday. Martens gave a presentation that was prepared by Fire Chief Salomon and himself regarding St. Maarten?s preparations in the past for hurricane events and the 2005 flood. Paul Martens told GIS on Wednesday that the presentation was well received by the attendees with many of them asking various questions with respect to disaster response and mitigation measures on St. Maarten. Disaster Coordinator Salomon added that the main discussion at the conference was about the lessons learned from hurricane Katrina and creating a culture of preparedness where citizen activism comes out in a response to a hurricane threat. Pedro De Weever from the GIS also attended the conference. It's hot and dry in the Caribbean! I think all the islands must need rain. Our beautiful green hills are brown now. Everyone gets nervous when it is so hot so early. It makes us all worry about a busy hurricane season. Speaking of hot, there is an interesting article just published on Caribbean coral. It is dying at alarming rates and much of it is due to record high sea temperatures.